What a blast! If you are looking for a Boston qualifier event, the Seoul Dong-A Marathon is it! This 40 km 26.2 mile fast, flat, wide-open course is one of the most well-organized events I have ever experienced. The 2015 marathon was March 15. Dong-A Marathon (동아마라톤) is one of the oldest races in Asia. The first Dong-A race was held in 1931. In the decades since, the race organizers have certainly perfected their game. The start of the event is at Gwanghwamun Square (광화문) and ends at Jamsil Sports Complex (잠실종합운동장). The weather this year was a chilly 4.5 degrees celsius (around 40 degrees fahrenheit) at the 8:00 am start, but quickly warmed above 10 degrees celsius (a perfect 50+ f) for most of the race. Sunny, no wind. The vibe at the start line was energetic: upbeat music, people dancing and whooping and having a good ol' time. One detail I must mention: There was absolutely no line for the ladies potties! I walked right into the (heated!) portable potty, chatted with a few ladies keeping warm in there, did my business, and was on my way. No line! What?? None. Apparently the marathon distance is a male-dominated event, which is a huge thumbs up in my book. You have to present a certified record of past race performance to be assigned to a predicted-finish-time corral. Since we did not present any such documentation, my husband and I were put into the last corral (E) by default. I expected this to be problematic; that I would be stuck behind a mass of plodders for 8 miles before I could find space and accelerate (like the beloved-but-crowded Marine Corps Marathon). The avenues in Seoul are so wide that I was immediately on-pace after crossing the start line. 20,000 runners in this event and not a single squeeze point in the whole race! 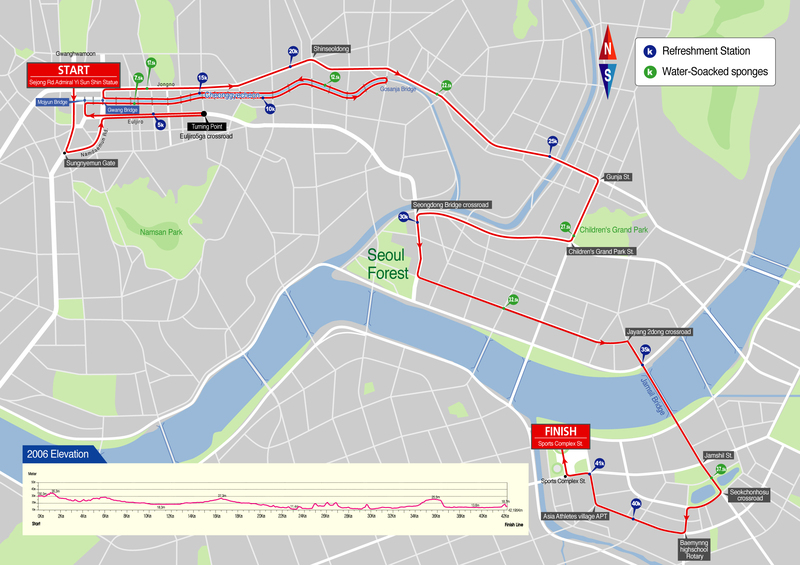 The course twists and turns in a concentrated area of Seoul for the first half, which equates to huge fan support. Lots of foam hand slapping, cow bells, pace group cadence songs, and special cheers for the blonde ajumma. I felt the love and it was motivating! Water and Pocari Sweat (like a less-sweet version of lemonade gatorade) were available exactly every three miles. Bananas and choco-pies were offered at fuel stations, so I was glad I had brought my own gu. I don't think I could have choked down and digested a choco-pie. Aid stations were plentiful, handing out water-soaked sponges, vaseline, and bandaids. The finish line at Jamsil Stadium is truly inspirational, with the last quarter mile sprint on the olympic track. I crossed the finish line feeling like a true athlete! Thank you, people of Seoul, for a memorable experience! I loved every minute of this marathon and highly recommend to anyone looking for a marathon personal best! 03:29:51 I'm going to boston! 04:12:36 massive 20 minute improvement!